Yep, it's true, Jon and I are expecting again! 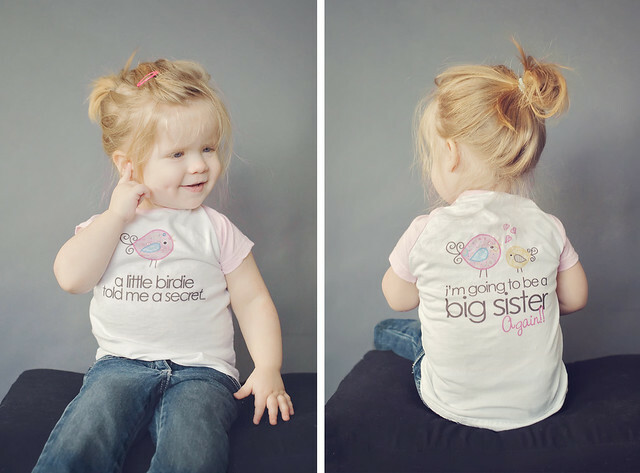 We found out on Dec. 30th, when I took a pregnancy test on a whim. I was hardly even late so I have no idea what prompted me to take it, but I just had a feeling. I cried and cried when I saw the second line, I just couldn't believe it. And yes, we had been trying for a while. 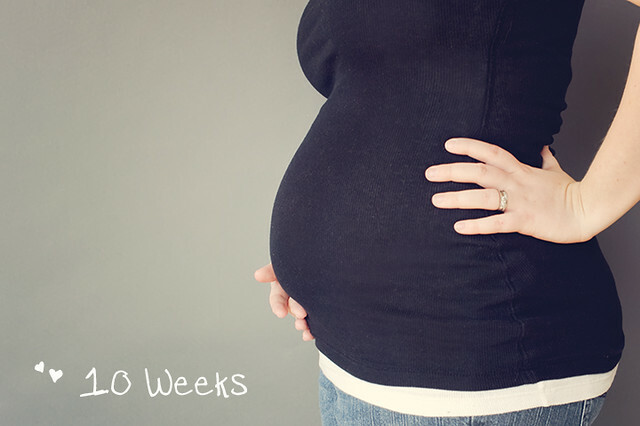 In June, after my postpartum check up we decided to start actively trying to conceive. We were devastated by the loss of Elijah, and it took a lot of late nights talking things out with my husband for us to decide to try again. But we knew we wanted Dylan to have a sibling somewhat close in age to grow up with, and we also wanted to have our children while we are still younger just in case there was the small chance there was an issue with our reproductive systems that had caused something to go wrong last pregnancy. Well, I waited and waited for my PP period to come and it was nowhere in sight come the end of June, so I was prescribed Provera to help out. Finally after getting my first cycle started at the end of June, I started charting and doing OPKs. And yes, I became one of those women who was obsessed with charting, I would try and time everything perfectly and then I would spend many nights staring at my chart expecting something magical to happen, but of course nothing ever did. A few months went by and I hardly had any positive OPKs and when I did it was very late in my cycle. Going from getting pregnant with two children with little to no effort to having to try and be disappointed every month seeing that one lonely line was very stressful. I know many people have struggled for years to get pregnant, and my heart goes out to them, just in the 7 months of trying I became very sad and discouraged. I felt that since I lost Elijah and I wasn't magically getting pregnant right away when trying, that maybe it just wasn't meant to happen, but I know I was just being very impatient and maybe even selfish. So come November, it had been six months, and I just thought something might be up. Either I wasn't ovulating or I was ovulating too late in my cycle for it to stick. My OB wanted to do some blood tests during my cycle to see when I was ovulating, and both in November and December I had my progesterone checked on day 21 of my cycle (I normally had 28 day cycles). Both tests showed that I had very low progesterone not consistent with ovulation. I was very sad, I felt like I had been trying for no reason for the last 7 months. After my test results in December we made an appointment for Feb. 14 (valentine's day of all days) to discuss medications to help out my cycles and kick start ovulation. 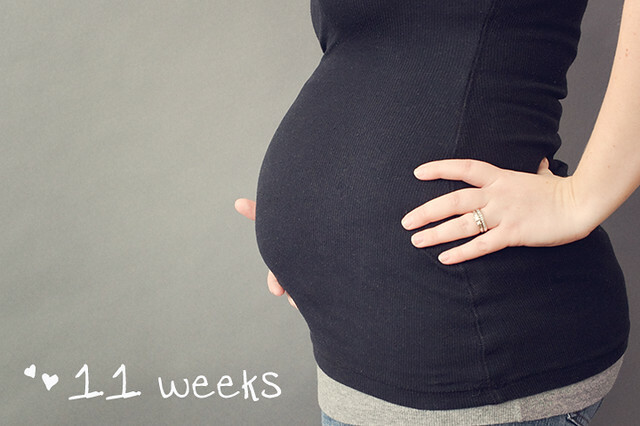 Exactly a week after scheduling that appointment, on a very weird whim, I used my last pregnancy test I had. Totally irrational, and I knew I was probably just setting myself up for disappointment. For about 30 seconds I stared at the test I knew would just end up making me cry. And to my amazement TWO lines appeared. I was in disbelief, just 7 days ago I had scheduled an appointment to discuss fertility treatment options, yet there staring back at me was a positive pregnancy test! I cried, then I sobbed, I couldn't believe it. I sent a photo of the test to my husband and he couldn't believe it either. But after buying a few more tests, they were all positive. I had no clue how it happened, and I didn't even really care, I was just so happy. I had blood work done to check my hcg and progesterone levels the following week and they were looking perfect, my progesterone was even back up to a normal level. 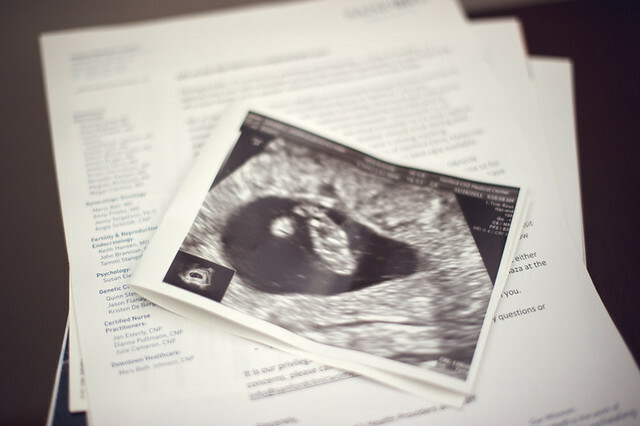 We had only told our parents at this point, because we really wanted to be cautious this time around, I wanted to know that this was a real and healthy pregnancy before telling everyone. 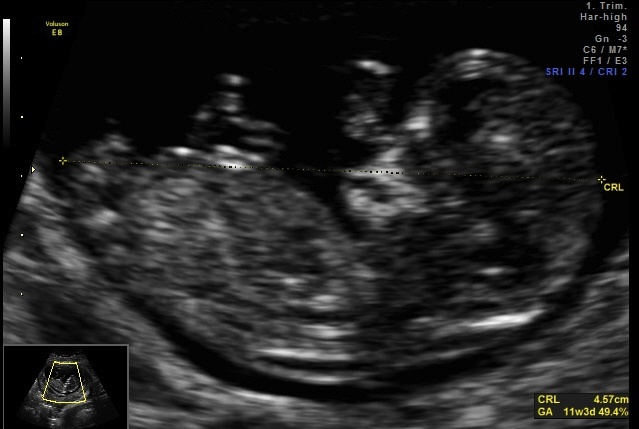 On Jan. 26th I had a dating ultrasound to see how far along I was, and this is what we saw. One healthy little bean measuring 7wks 1day with a strong heart rate of 157. We were so relieved to see that heart beat and for it to be in a normal range, our first ultrasound with Elijah showed a heart rate of over 200. 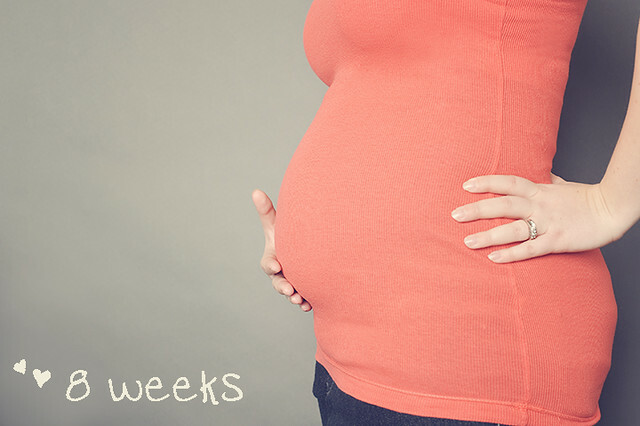 My next appointment wasn't scheduled until Feb. 23 at 11weeks, and let me just say that was the longest wait ever. Yesterday was my first OB appointment and I also had the first trimester screening. I was a nervous wreck. I was sick to my stomach thinking about what might happen. 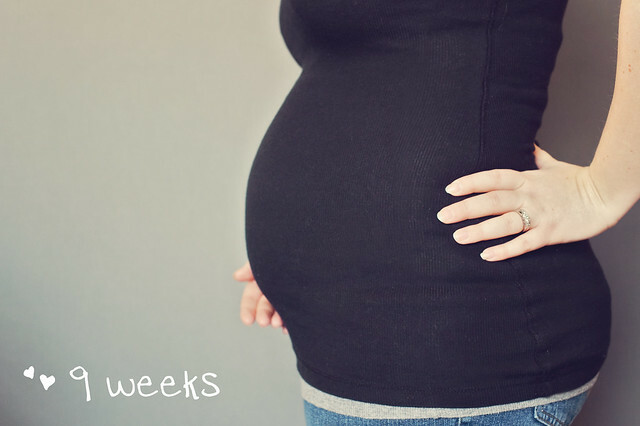 With Elijah we found out around 11 weeks that there were complications, so I was terrified of reliving that experience. My OB appointment went great, it was just a basic exam, but it was so nice being able to talk to her again and express our excitement and fears. 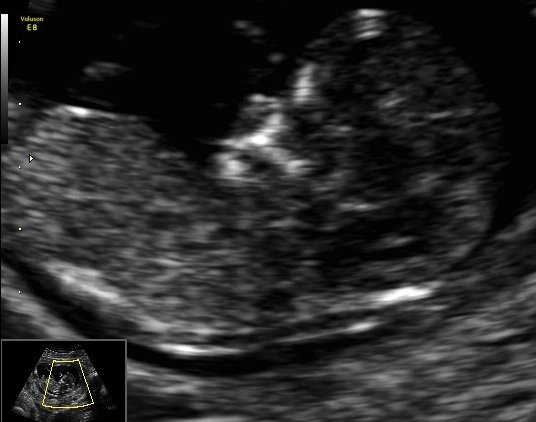 After that I met with our same genetic councilor who went over what the ultrasound was going to look for. Next was the ultrasound. I was so scared. Thankfully my mom and husband were able to be there with me. Immediately, we see a precious little baby giving us a big thumbs up. That's when I starting crying. Then the tech said it was in a perfect position to do the measurements. 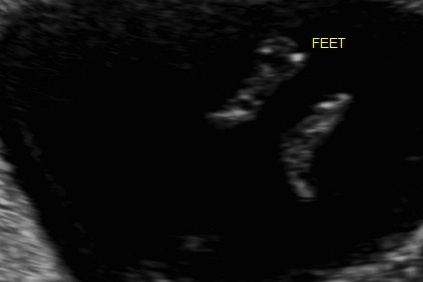 The nuchal fold is what they measure behind the neck and when there is a high measurement of fluid, that usually is an indicator that something is not right. They consider a normal measurement to be under 3, Elijah's measured 4.5. Right away I could tell that things looked better with this baby, and the tech said with much joy that it was measuring 1.4, which is normal. My mom, my husband, and I all let out a huge sigh of relief, and lot of tears. Everything else measured perfectly. 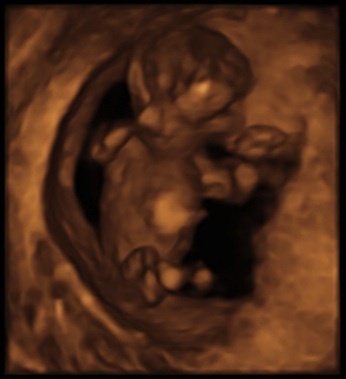 We got to see some 3D and 4D images, and have a cute little video of the baby dancing around. We just feel so relieved and so blessed to be able to have another chance at having a healthy baby. I've never known what I wanted to do with my life, but one thing I've always been sure of is that I was meant to be a mother, and I'm so thankful to have that opportunity again. Also, I want to thank all of you for your support throughout the last year or so, I wouldn't have been able to get through all of this without such kind words of support and comfort. I know now more than ever how fragile life can be, and it makes me appreciate everything I have so much more. 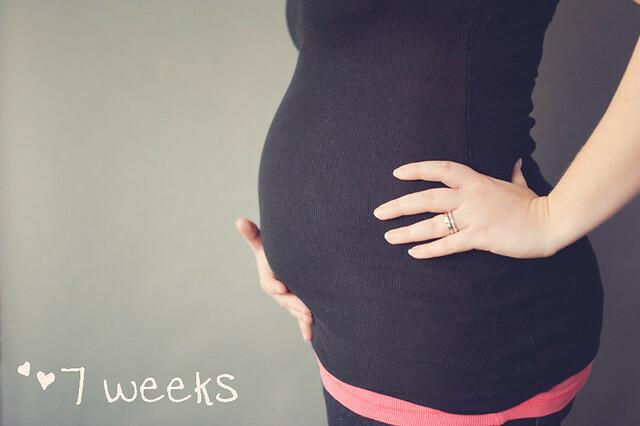 I know I'm still going to struggle with grieving the loss of elijah, and it will probably make this pregnancy a little more stressful, but I will continue to update you with my thoughts, fears, and joys. The due date is September 13, 2011. I am so happy for you, Laura! Wishing you a happy and healthy nine months! Stumbled upon your blog via TheBump - I love your photos - you are so very creative! Congratulations on your pregnancy! Don't want to seem like a creeper or anything but I followed your blog with Elijah and now checking up on you, I'm SO happy to see you are expecting another little miracle! I am pregnant too and due just 2 days before you..and I have a 20 month old as well! lol. I can't imagine your loss and I admire your strength SO much after everything you've been through. I know this pregnancy will be full of worry (I had a miscarriage in November and definitely feel more worry during this pregnancy than my first b/c I know things aren't always perfect) but I also know this pregnancy will be full of happiness and hope for you as well! You and your family are an inspiration. Congrats! !